*Life in Miniature*: Are You a 'Civilized' Person? Would you have been suited to life in the Victorian period? Would you know what dress to wear to a fancy ball, how to greet acquaintances in the park, or what to do when you find a fly in your soup? 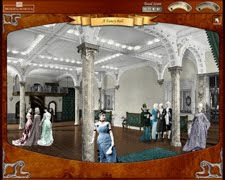 To find out, check out this hilarious interactive game at the McCord Museum of Canadian History. Choose the role of a man or a woman and then visit five different places to test your social skills and graces. Apparently I have good manners, but my fashion sense - then, as now - leaves something to be desired. At least in modern times I've never had a servant chase me out of the club and beat me with a rolling pin, been carried off by aliens, or had vampires chase me around the garden at a fancy dress ball (ok, I picked the wedding dress on purpose just to see what would happen)! When you're done there try your skills in the Roaring Twenties or see how well you know 19th-century fashion with the museum's other games. You can also learn more about the history of Canada in the 19th and 20th centuries through the museum's virtual thematic tours. Amazing, I am a picture of politeness! Gracias por los enlaces, ahora mismo voy a jugar un ratito. Necesito divertirme jejejeje y veo que tu te lo has pasado genial. O no, now I am going to spend hours at the site! :) Will see what the score for my nieces are as well :) Thank you Grace for sharing!